Divinity: Original Sin 2 - Definitive Edition is coming to Mac next year. 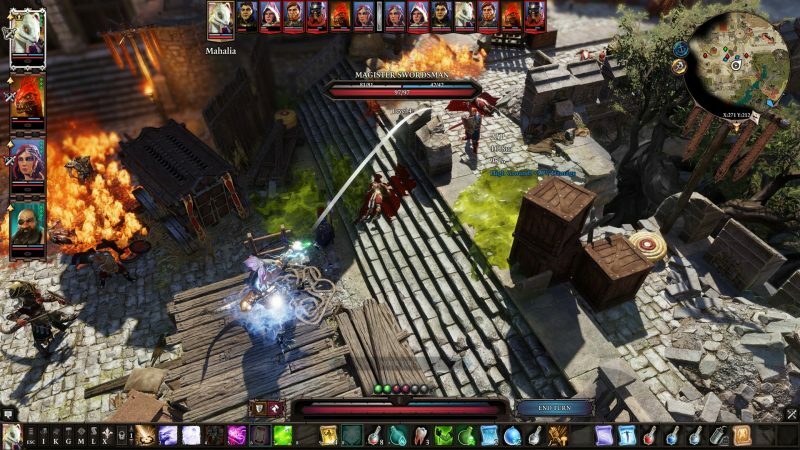 The critically acclaimed role-playing game from Larian Studios featured in yesterday's Apple event in New York, where Apple unveiled new Macs and iPad Pros. Elverils plans compatibility with systems running macOS 10.13 and 10.14 macOS, with potential for 10.12 support further down the line, while MacBook Pro Touch Bar support should equate to quick access to in-game features like the journal or map. Divinity: Original Sin 2 will also support HDR, iCloud backups, and cross-play between Windows and macOS systems. More information including pricing is expected as the game gets closer to its Q1 2019 release, when it should be available to purchase on both Steam and the Mac App Store. Cool news! Wonder why it's not Metal 2, though. Or what does Metal 1.2 mean? It’s probably just a typo, but Metal version numbers are misleading at any rate. “Metal 2” is just “Metal 1.2” with more functionality, but those functions are only supported on High Sierra and Mojave. It’s not like DirectX11 vs 12 where operational methods are quite different. This is great news for those Mac gamers who don't run Windows via. Bootcamp. The DOS games are pretty compelling in many regards. There is some great stuff, like the way they somehow managed to interject whimsy into an essentially serious story. But, do keep in mind that you will have to enjoy true turn-based combat that can't be defeated. It's like Fallout 1 & 2. You have to micro-manage every little tiny thing during combat, which is extremely tedious and time-consuming, even on the easiest difficulty settings. It's too bad, because it means I've never been able to make it all the way through, despite really liking the overall concept (same happened to me with Fallout 1 & 2). I really, really like old-school RPGs like BG and IWD etc., along with the more recent DAO (my personal favorite) and PoE. The difference is that in those games you set up one form or another of AI scripting/actions for combat situations and can set a variety of auto-pause states and/or manually pause when necessary. So most true-classic and retro-classic RPGs actually provide far more flexibility in terms of combat mechanics than DOS, as they can be as turn-based as you wish, without absolutely forcing you to use an exclusively micro-managed turn-based system. It's a real oversight on the part of the developers as it unnecessarily limits the appeal of the titles. Been playing this since it was new, definitely one of the purest RPG experiences you can get on a computer. Really maintains that feel of classics like Baldur's Gate while adding even more player choice and modern conveniences. Excellent game. Turn-based is not at all tedious, if the combat is interesting and varied, which DOS was. Realtime-with-pause is far more annoying, and essentially an admission that they failed to make the combat interesting, so you have to automate it as much as possible and get it over with quickly. I bought two RTWP games that were supposed to be all-time classics, and gave up after a few hours due to how aggravating they were, so I avoid them all now. Real time only works properly if you're controlling one character. If the number of reviews on Steam is any indication, proper turn-based does not limit the audience, and indeed increases it quite a bit compared to RTWP games. You may have skim-read what I wrote. I'm not opposed, at all, to turn-based combat, if you like it! Personally, I find it very tedious and time-consuming, and I'm far more into the story-and-character-and-exploration elements of RPGs - the last thing I want to do is spend 10 minutes micro-managing a combat that I would prefer to be over in a much shorter time and get back to the exploration, meeting new characters, and learning more of the story. That's a preference where we obviously differ, which is no problem. Many RPGs, including a huge array of the classics, allow you to tweak these preferences to the player's satisfaction. Many of them could be completely turn-based if you so desired, or only auto-pause on occasion, or even just pause manually if that was your desire. That gives me what I want, and gives you what you want. It's not a failure in any way; it allows people to play these games in the way they prefer. The DOS games don't do this, at all, it's pure turn-based without any meaningful way to play the games in a less micro-managing manner. Could either be a mistake, or they mean "Metal 1.2 and higher". They need to make use of Metal 2 features when they want to support eGPUs. But Metal 2 is only available in High Sierra and Mojave, and they are planning to support Sierra as well ("further down the line").